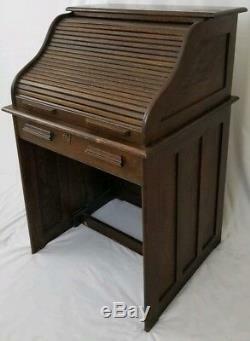 Beautiful Arts & Crafts/Mission desk with a tambour style roll top door. 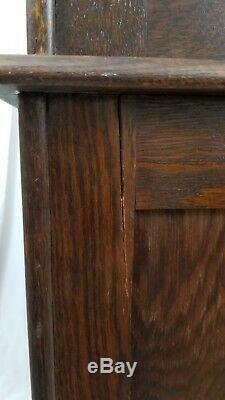 Desk was made of solid tiger oak on June 24, 1939. Date is written on the bottom of the inside of the drawer. 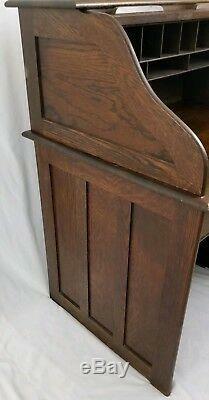 Desk has beautiful raised panel sides and back, roll top front and plenty of divider/storage inside. 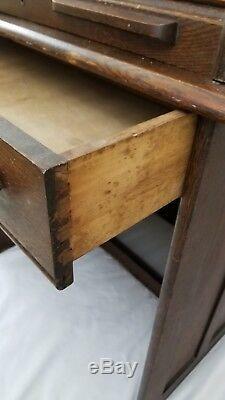 The drawers have hand cut dove tailed corners. 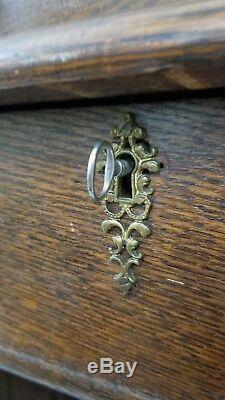 The original key locks the drawer. Desk measures 30" wide x 38" deep x 45 3/4 tall overall. 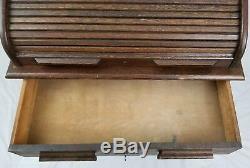 The drawer is 25" x 12" x 3 1/4. The desk top is 28 1/4" x 21 1/4" x 12 3/4 tall. The top is divided into 7 - 3 1/2" x 3 1/2" x 6" slots and 3 - 8 1/2" x 2" x 6" slots. 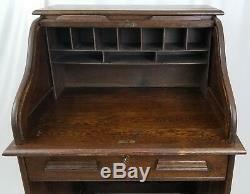 Desk is in wonderful vintage/antique condition with age appropriate wear. There is one age crack at the back center of the bottom half. Top is not attached to top permanently and is held in place by two dowels. Please view description and photos carefully. The photos count as part of the description in case I miss a visual defect in the written description. Thanks for looking and be sure to check out my other items in our store regenerationstation352. 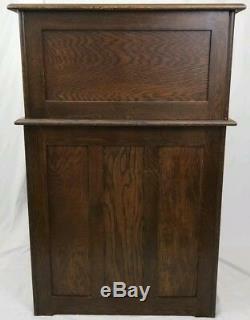 The item "Vintage tiger oak roll top desk raised panel arts & crafts Mission style 1939" is in sale since Sunday, March 17, 2019. 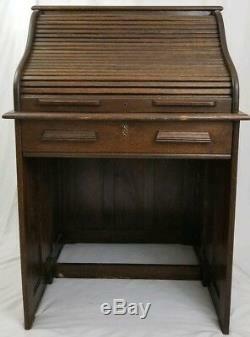 This item is in the category "Antiques\Furniture\Desks & Secretaries\1900-1950". The seller is "regenerationstation352" and is located in Belleview, Florida. This item can be shipped to United States.